Good morning friends, I’m your host, Hercules. It’s another lovely day outside, and I’m feeling excellent after my morning tea and alkaline pH 9.0 water. 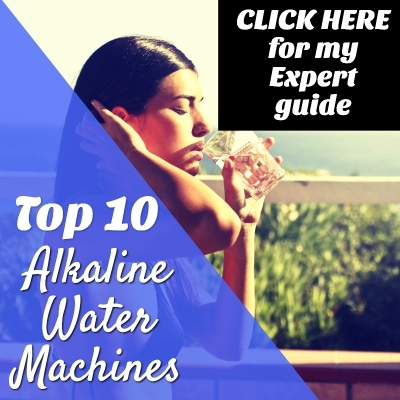 This morning, I am finishing my list of top 10 best alkaline water ionizer machines with my Chanson Violet water ionizer review. This is my first review of a Chanson water ionizer, and it surely won’t be my last. Chanson is an alkaline water brand I had the pleasure of stumbling upon while I lived in Taiwan. There was a Chanson store selling their water ionizers exclusively near my apartment in Kaohsiung, Taiwan. Once I began drinking alkaline water on a daily basis, I strolled into the Chanson store to check out their ionizers, and I instantly fell in love. I could tell right off that Chanson designed some of the best alkaline water machines in the world. All Chanson ionizers have attractive designs, but it’s what’s inside that counts the most, right? There are several features that Chanson hangs their hat on that I haven’t seen offered or highlighted by other alkaline water brands I’ve reviewed. As promised, I will create handy tables and charts for you to review once I finish sharing my Chanson Violet review with you below. In those tables, I will compare my top 10 picks. What are people saying about the Chanson Violet? It wasn’t a tough choice for me to choose which ionizer I wanted to review to complete my top 10. I had wanted to review Chanson from the beginning since I knew about the superior quality water Chanson offers. The Chanson Violet model is the most economical ionizer designed my Chanson. It’s their entry unit for new alkaline water machine owners or seasoned veterans. Chanson has some tricks up their sleeve that makes even their most affordable ionizer one of the best money can buy. Chanson has a 3-year “bumper to bumper” warranty on their Violet model. This means if anything goes wrong due to a product defect, Chanson will cover the repair and replacement costs. There is no need for a lifetime warranty for a Chanson ionizer because of the premium titanium plates they use in their ionizers. One of my favorites features of Chanson water ionizers is the design. The Violet has an attractive silver body that should fit well in any kitchen. The rounded edges at the corners of the machine also make for a more sleek design that I appreciate. The Chanson Violet uses a chemical-free, single silver-impregnated activated carbon filter that is naturally antibacterial. My fellow health nuts out there know that colloidal silver does a great job of killing harmful bacteria. I’ll go into greater detail of why I think Chanson offers the best activated carbon filter in my filter replacement section below. Each filter lasts you 10 – 12 months. This Violet produces water in the pH 3-10.5 range. The ORP range is +1,000mV to -825mV. You’ll surely get a ton of antioxidants in every glass at -825mV. Chanson’s plates also ensure that the ORP value stays consistent and won’t degrade over time. Other non-premium alkaline water machines use ionizer plates that degrade. The Chanson Violet is countertop or wall mount. I think a professional plumber could install the unit under the counter, but I do not see an under counter installation package provided by Chanson. Chanson engineers with 20 years of experience discovered that high wattage hurts the life of the plates. Therefore, they designed the Chanson Violet to run on lower wattage. This means you save money on your power bill and get an ionizer with a longer life. The Chanson Violet has 5 solid titanium plates dipped in 99.998% pure titanium. Even though the Violet has fewer plates, the Chanson technology is superior. Chanson prides itself on having a higher effective surface area on its place than any other brand in the world. Their special design guarantees more efficient ionization and a consistent ORP value. Similar to most units I’ve reviewed, Chanson offers 7 different water settings: 4 alkaline levels, 2 acidic water levels, and 1 pH neutral setting. The Violet’s dimensions are 8.86″ Wide x 4.72″ Deep x 13″ Tall. The unit weighs 12.0 lbs. The Violet has a self-cleaning function that automatically sets the cleaning cycle. The Violet can figure out what is best for your water without you having to do anything extra. The cleaning cycle happens each time you turn the machine off. There’s no need to worry about waiting for the machine to clean itself when you start it up. There is an auto-flush function when you start the unit that clears any old water in the hose for you. I personally like that feature a lot. The ionizer also has a special auto-adjust function that changes the settings in the machine automatically for your water. This features guarantees that you get an accurate pH for your water every time. There is a filter life indicator on the LCD display. The Violet can test filter life without you having to do any guesswork. The flow rate is 2.0 to 2.5 liters a minute with 45 PSI water pressure. International buyers can also order the Violet. The unit is 110-220V. International buyers need to contact the seller for a 220v connection. The Violet can ionize water between 41 to 103 degrees F.
It operates with water pressure between 5 to 95 psi. The Violet comes with a free pH test kit. 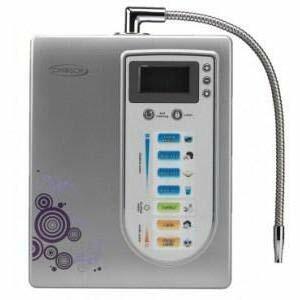 Chanson ionizers use incredibly efficient titanium plates that have more effective surface area than any other alkaline water machines on the market. Even though the Violet has fewer plates than other ionizers in a similar price range, it can produce a higher quality alkaline water. Installation of the Chanson Violet is simple for everyone. Chanson includes all the parts you need for a countertop installation or a wall-mounted installation. If you choose to install the ionizer under the sink, you may need to hire a professional to get the job done. If you decide to take the under the sink route, the Violet has a function that clears out any standing water in the machine when you turn it on. This way, you know for sure that you are always getting the freshest alkaline or acidic water. For those of you who want to avoid installing the unit by yourself, Amazon offers an expert installation package. Simply choose the expert installation option at the top of the page by clicking here. The Amazon experts will install the unit, test it to make sure everything is copacetic, then clean up after themselves. 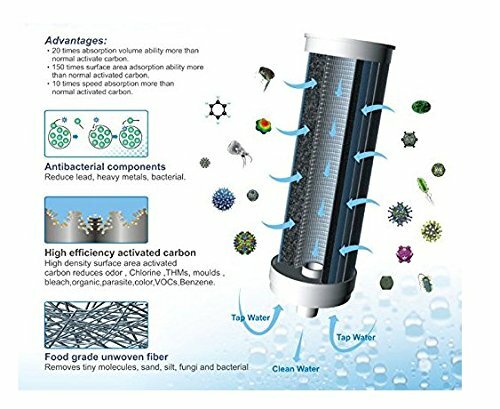 The Violet uses a single activated carbon filter that I think is the best carbon filter offered by an alkaline water machine outside of the Tyent UCE-11. Chanson uses silver-impregnated activated carbon. The purpose of the silver is for its anti-bacterial properties. Silver is a well-known antimicrobial agent. It does a better job of removing any bacteria, fungi, and harmful chemicals in your source water. The Violet uses the most high-tech activated carbon filter I’ve come across that is silver-impregnated. You can be sure that you and your family are drinking the cleanest water possible. Each filter should last you almost a full year. Chanson is one of the new kids on the block in the United States, but they have a strong presence in Asia. I first discovered Chanson water while I was living in Taiwan. The Chanson Violet uses a state-of-the-art carbon filter that’s made in Japan. Japan is the leading authority on alkaline water benefits. Japanese doctors have been successfully helping patients by recommending alkaline water for quite some time now. There are currently only two reviews of the Chanson Violet. Both of the reviews are five-star from verified buyers. Antioxidants in the water will rejuvenate cells. This is the main anti-aging benefit. Better hydration leads to improved digestion and bowel quality. Many people experience weight loss without doing anything extra. The acidic water is good for cosmetic use. The Chanson Violet may not have as many reviews as the other alkaline water machines on my top 10 list of best water ionizers, but it’s easily one of my favorites. Like I mentioned before, I had the chance to see Chanson ionizers in person. I think Chanson ionizers are the most attractive units currently on the market. I also love the silver-impregnated activated carbon filter and the electrode plates Chanson uses. All their technology is cutting-edge, unlike some other ionizers I’ve come across. If you like the Chanson Violet, you can also consider taking a look a the Chanson Miracle by clicking here. Whichever model you choose, your family’s health will skyrocket when you install a new Chanson ionizer in your home!